It cannot be seriously disputed that Amnesty International’s reports on Operation Protective Edge lacked objectivity and professionalism. They betrayed a systematic anti-Palestinian bias amounting to apologetics on Israel’s behalf. They also marked a steep regression from the high standard Amnesty set in its reports on the Israel-Palestine conflict during the past two decades. Amnesty will no doubt be tempted to respond that if this writer criticizes its pro-Israel bias while Israel criticizes its pro-Palestinian bias, Amnesty must be doing something right. But that’s as if to say, if one gets attacked by the flat-Earthers at one extreme and the round-Earthers at the other, then it proves that the oblong-Earthers must be telling the truth. A detailed, responsible critique of Amnesty warrants a detailed, responsible reply. Anything short of one will only confirm the charges leveled. It is a separate but still important question, What happened? In the absence of a smoking gun, one can only speculate on the springs of Amnesty’s abrupt change of course. In fact, Amnesty is just the most recent of several high-profile cases. In 2011, the South African jurist Richard Goldstone, who chaired the UN Human Rights Council commission investigating Operation Cast Lead, abruptly recanted his support of the commission’s report, after a vicious ad hominem campaign waged by Israel and its supporters.Finkelstein, Method and Madness, chapter 3. In 2014, the University of Illinois at Urbana-Champaign abruptly rescinded the appointment of a professor “following a campaign by pro-Israel students, faculty members and donors.”Robert Mackey, “Professor’s Angry Tweets on Gaza Cost Him a Job,” New York Times (12 September 2014). For a careful assessment of this case, see American Association of University Professors, Academic Freedom and Tenure: The University of Illinois at Urbana-Champaign (April 2015), which concluded that “aborting an appointment in this manner without having demonstrated cause is tantamount to summary dismissal, an action categorically inimical to academic due process.” It is no secret that, in recent years, Israel has been losing the battle for public opinion in the West, especially in liberal precincts such as college campuses and the human rights community.In fairness to Amnesty, it does absolve Hamas (if just barely) of the widely reported charge of “human shielding.” 2014 Gaza Conflict alleged that Hamas engaged in coercive “human shielding” on the dubious basis of “eyewitness testimony from a number of IDF officers” (paras. 161-64). 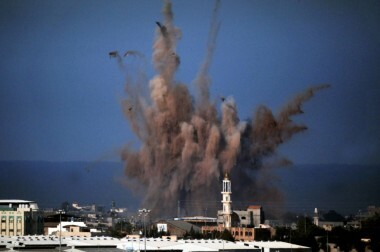 Just as in Operation Cast Lead, it turns out that during OPE it was not Hamas but Israel that practiced human shielding. Finkelstein, “This Time,” pp. 88-89; Medical Fact-Finding Mission, pp. 91, 94. It is also no secret that the Israel lobby has resorted to intimidating and strong-arm tactics in order to silence criticism emanating from these quarters. Amnesty has been in the sights of Israel lobby groups such as NGO Monitor.NGO Monitor, Amnesty International: Failed methodology, corruption, and anti-Israel bias (23 February 2015). A recent vote on anti-Semitism by Amnesty’s UK branch suggests that their tactics are having the desired effect. All the available evidence points to the conclusion that anti-Semitism is at most a marginal phenomenon in British life; according to survey results, well under 10 percent of the population holds a negative opinion of Jews, whereas 60 percent holds a negative opinion of Roma/Gypsies and 40 percent a negative opinion of Muslims.Pew Research Center, Faith in European Project Reviving (June 2015); YouGov, “Roma People and Muslims Are the Least Tolerated Minorities in Europe” (May 2015). 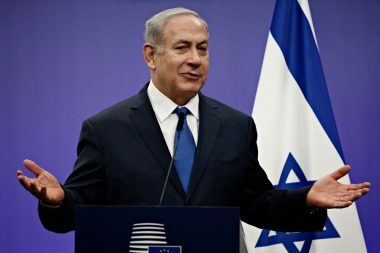 The manifest purpose of the periodic campaigns bewailing a “new anti-Semitism” is to stifle criticism of Israel’s atrocious human rights record.Finkelstein, Beyond Chutzpah, part 1. Yet, Amnesty’s UK Board signed on to, while the membership narrowly defeated (468-461), a 2015 resolution calling for an Amnesty UK campaign against resurgent anti-Semitism.Amnesty International, UK, Section Board Meeting, “Draft Minutes of the Meeting Held on Saturday 21 March 2015,” MB 39/15 (amnesty.org.uk/webfm_send/1287); Rosa Doherty, “Amnesty Rejects Call to Campaign against Anti-Semitism,” Jewish Chronicle (21 April 2015). Whatever the cause of Amnesty’s volte-face, the damage it has done cannot be denied. Supporters of Palestinian human rights and a just and lasting peace have come to depend on Amnesty as a credible corrective to Israeli hasbara and frequent pro-Israel media bias. The abdication of its professional mandate cannot but dismay. Amnesty’s worst sin, however, runs much deeper: its abandonment of a forsaken people suffering under an illegal and inhuman blockade punctuated by periodic, ever-escalating massacres. If only for the sake of the people of Gaza, one hopes that Amnesty will yet find its way. An earlier draft of this text was forwarded to Philip Luther, director of Amnesty International’s Middle East and North Africa division, and to knowledgeable personalities in Gaza. Their input improved the quality of the final version. Maren Hackmann-Mahajan and Jamie Stern-Weiner provided invaluable assistance. Finkelstein, Method and Madness, chapter 3. In fairness to Amnesty, it does absolve Hamas (if just barely) of the widely reported charge of “human shielding.” 2014 Gaza Conflict alleged that Hamas engaged in coercive “human shielding” on the dubious basis of “eyewitness testimony from a number of IDF officers” (paras. 161-64). Just as in Operation Cast Lead, it turns out that during OPE it was not Hamas but Israel that practiced human shielding. Finkelstein, “This Time,” pp. 88-89; Medical Fact-Finding Mission, pp. 91, 94. NGO Monitor, Amnesty International: Failed methodology, corruption, and anti-Israel bias (23 February 2015). Pew Research Center, Faith in European Project Reviving (June 2015); YouGov, “Roma People and Muslims Are the Least Tolerated Minorities in Europe” (May 2015). Finkelstein, Beyond Chutzpah, part 1. Amnesty International, UK, Section Board Meeting, “Draft Minutes of the Meeting Held on Saturday 21 March 2015,” MB 39/15 (amnesty.org.uk/webfm_send/1287); Rosa Doherty, “Amnesty Rejects Call to Campaign against Anti-Semitism,” Jewish Chronicle (21 April 2015). 7 Comments to "Amnesty's Betrayal of a Forsaken People"
HOW JUDIASTS CONTROL PEOPLE—THE CARROT AND THE STICK, EXPOSED! Thanks for the great article you wrote on this topic with lots of useful information. So how do the Judaists control Goldstone, Dr. Toaff, and Amnesty International? Well, there are 2 ways to control people—either the carrot (bribe) or the stick. Carrots: For example, US Congress is bribed with campaign contributions by the Jewish lobby. Israel is the world leader in money laundering. Not only is the Jewish lobby the biggest campaign contributor (legal amounts), it also pays billions under the table. Most of our politicians and others very likely have secret bank accounts in Israel where millions are deposited in their secret bank accounts once they do the Lobby’s bidding—support Israel and destroy USA with the alien invasion and liberalism. These secret bank accounts are in their Jewish names. For example, Senator John McCain’s Israeli ID and bank account name could be something like Jonah Ben McKenstein. This is based on the fact that slavish support for Israel (a criminal state) and the inhumane and barbaric practice of allowing millions to invade your own country (aka immigration) or imprisoning people for debating the holocaust are so repugnant to civilized behavior, that no civilized person would do such despicable things unless paid millions in bribes. Sticks: Some people will not obey the Jewish lobby even when bribed. For them, the Jewish lobby uses the stick method. These stick methods involve defaming people by calling them racists, anti-semite, etc. in the Jewish controlled media, taking them to Israel and taking their secret pics (cameras in vents) with girls sent to their hotel rooms and then blackmailing them, creating bogus scandals, filing phoney cases against them and even framing them and having them criminally prosecuted on bogus charges. Now you know the secret to Jewish power and influence. Actually the Earth isn’t flat or oblong. It’s not round either. It’s obwide, i.e. bigger at the equator. And you’ve just witnessed the birth of a new word –I think (and so does spellcheck). Any faith in Amnesty International to do the right thing is misplaced. I’d asked (several times) to meet with a representative and was stonewalled; apparently because of the ‘quality’ of the enemies I’d made. I began looking into intelligence agency penetration of Amnesty International; and formally withdrew my request for a meeting in 2011. My spellcheck recognizes oblate spheroid. It’s great that you have a column here Norman. I have several of your books. You forgot to mention the very jewish national victim cult scheme labeled “diversity”. Diversity is an ultra-large scale vote buying scheme, among other things. The jewish diversity scheme conditions victim cult people to trade votes for undue privileges offered by totalitarian democratic government. Victim cultists are people that do not match the jewish concocted profile of a Nazi – white supremacist…. Both the US and Israel are dominated by this jewish political scheme. Over 85% of the voting population of the US and Israel are victim cultists…. It’s amazing how many pro Jewish state agents are peppered throughout all American media and world media. When I write comments which I do very carefully within the approved guidelines they always get thrown out if any of the writing has “Jew, Jewish, or Israel” in it. Have they set all the comment reading robots to react to those words regardless of content? Even when writing fact based comments on NPR (National Propaganda Radio) about the Trump/ Ramos clash my comments were removed! And that’s supposed to be public in the land of freedom of speech, or so they say. No doubt crypto Israeli sympathizers have infiltrated Amnesty Int. They have to point the finger a little bit sometimes to create a facade of legitimacy but underneath it all nothing really happens. Just like Human Rights Watch and others. Kudos to the Unz Review for allowing open discussion!!! !